One of the most powerful grinders in its class, the 4.5" WP12-115 Quick angle grinder produces an astounding 1,250 Watts and is engineered for a broad range of grinding, cutting, deburring and fast metal removal applications in heavy industrial jobs. 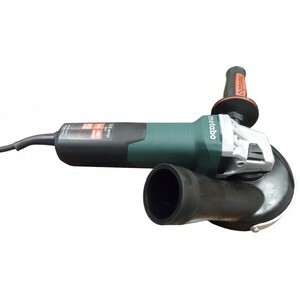 This compact angle grinder features a smaller, ergonomically designed body with integrated non-locking paddle switch for increased safety and more comfort, the quickest wheel change system available, and a tool-free quick-positioning guard that allows for fast change-over from grinding to cutting. The powerful Long Life 10.5 Amp, AC/DC, 11,000 rpm motor includes advanced designs to optimize air flow for cooler operation and extend longevity in harsh environments. The S-Automatic Safety Slip Clutch helps to prevent kick back if a disc or wheel should jam.